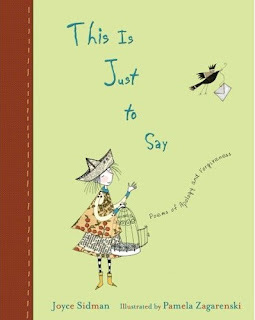 This is Just to Say: poems of apology and forgiveness (2007) by Joyce Sidman and illustrated by Pamela Zagarenski. (H/T Sally Murphy, Laura Salas, Margaret Simon, Reading to the Core, and others.) Also inspired by William Carlos Williams' famous This is Just to Say poem, this collection of poems has two sections. In the first section, an imaginary class of students shares their own apology poems (some false, some not) inspired by William Carlos Williams. In the second section, they shared those poems with the intended recipient and asked them to write a poem back in response. Some "students" also wrote back on behalf of non-writing recipients, like the class pet or a school statue. It is a really interesting collection of poems. A few follow very closely to the format of the original poem while many simply take the idea of apology and run with it. Some of the response poems are quite humorous, others are sweet, and a few are just heartbreaking (another student writing back on behalf of a helicopter-tiger mom who thinks the assignment is ridiculous). Just a heads up, I noticed many Amazon reviewers taking issue with the language in two poems (an older sister's "I'm still really / pissed off at you" and a father's "christ" as an interjection). I think this would be a really interesting exercise in point-of-view to try with students. As part of our poetry unit I already have my third graders write false apology poems. It would be fun to follow up on that a few days later by sharing some of these poems and then asking my students to write their own apology-response poems from another perspective. Happy Poetry Friday! Kimberley has this week's roundup over on Google+. I love that idea! Great Earth Day connection, thanks Carol. I'm looking forward to this book. WCW is one of my favorites. I especially like the idea of unusual apology poems in unexpected voices. Thanks for the recommendation. Enjoy it! It's neat to see how apologizing to someone (by poem) can have an impact. It is a great book to use for all ages, Katie. My students (middle school) loved writing apology poems just as much as younger ones do. Thanks, Linda. I could see that. These types of poems are so fun! This would be a great activity! I like activities that give students some structure but then also some freedom. And this also gives them something to anchor their writing in case they are stuck for an idea. I can imagine some of the poems would be close to their heart! Thanks, Jen. It would definitely take some modeling to get them to be thoughtful, but there are some great examples. In previous years, just sharing the "Forgive Me, I Meant to Do It" book only resulted in humorously evil poems ... ! Giving a variety, certainly helps give students a wider range of ways to be creative in their "apologies"!